In 2013, Ouest-France, together with Twipe, launched the very first digital-only newspaper in France. Since then they’ve had great success, just reaching 20 million monthly page views in August. We will hear the story of success for L’édition du Soir at the Digital Growth Summit in Rennes next month–make sure to register this week to save your spot. As we approach the 5th anniversary of this innovative news product, we want to take a look back at what has been crucial for its success. A few years ago at Ouest-France, they started to sense a new trend in their audience’s reading habits, with more reading happening in the evening. They knew they wanted to leverage this new moment of consumption, so they created a whole new edition to meet their readers’ changing needs. To target these readers who are looking for something to read during their commute from work or while relaxing at home, Ouest-France created L’édition du Soir, published each weeknight at 6 PM. The edition is also optimised for the interests of readers during this time period, so there are more games and puzzles to help readers relax, in addition to reading the news. By creating a new edition that utilizes the time downtime readers have in the evening, Ouest-France has been able to attract a larger audience and engage their current audience more deeply. This goes back to one of the 7 key essentials for newsrooms: publish at the convenience of your audience, not of the newsroom. L’édition du Soir was one of the success stories we studied in a report earlier this year, “Reinventing Digital Editions: Best Practices from Leading European Publishers“. The follow up report with our latest research on the readers of digital news themselves will be published next month, subscribe here to receive your copy. Their first target of 10,000 recurring users coming to the platform at least three times a week was met within the edition’s first year, with numbers growing rapidly ever since.These numbers have since grown exponentially, with unique monthly visitors settling at an almost-constant 1.8 million, and an average of 130,000 recurring users. 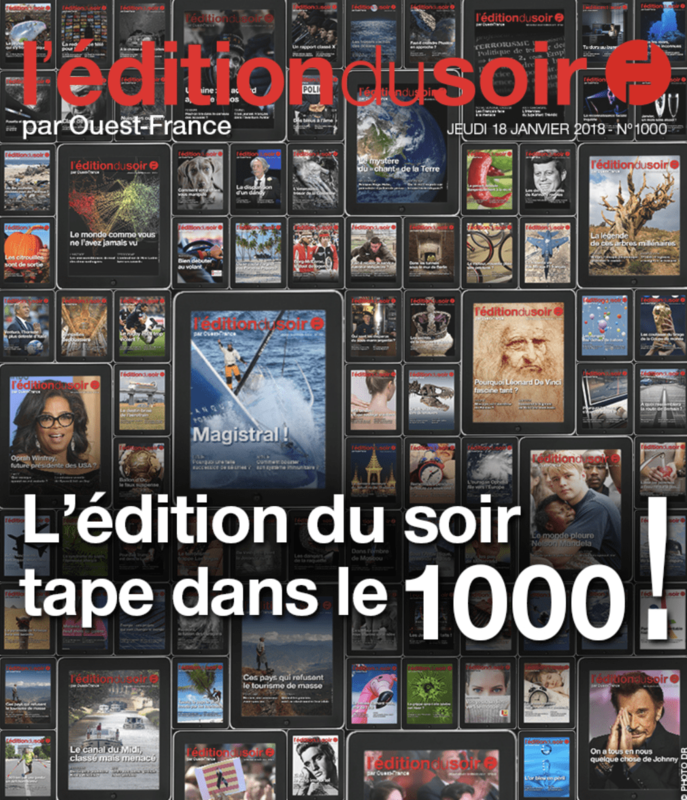 Earlier this year L’édition du Soir published its 1,000 edition. 47% of new subscribers report that running out of free articles prompted them to subscribe. That’s one of the reasons we co-created with Ouest-France a dynamic freemium paywall approach for L’édition du Soir, which has helped new readers discover this innovative news format. Currently, readers can read five pages each week without registering, another ten pages are unlocked by providing an email address, while additional articles are unlocked through viewing 30 second commercial videos (made possible through an integration with Viewpay in our NextGen WebApp solution). One thing that has been key for the team behind L’édition du Soir is developing strong collaborations with their innovation partners. This has enabled them to continue to grow and innovate, while still producing quality daily content. Twipe co-developed L’édition du Soir with Ouest-France in 2013 and in the years since we’ve worked together to continuously innovate and improve. They also credit having a diverse team as key to their innovation strategy. By bringing together several trades, not just journalists, to work on this project, they have been able to innovate and test many new ideas. The team views L’édition du Soir as a startup within the larger Ouest-France organisation. 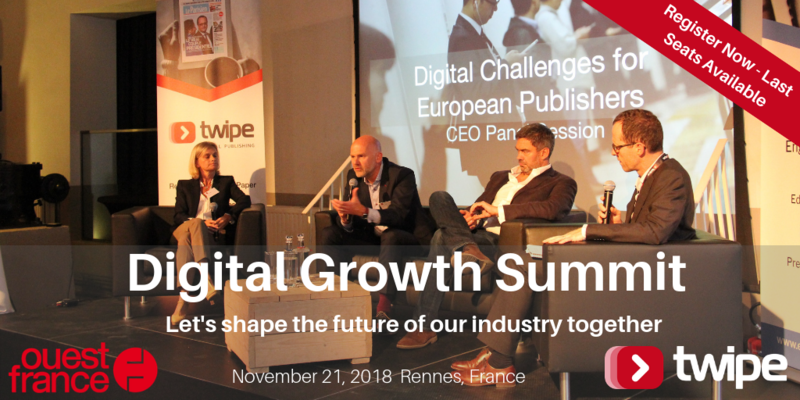 To hear the full story of success, register for the Digital Growth Summit in Rennes next month where the team behind L’édition du Soir will be speaking. This entry was posted in Industry news and tagged Digital publishing, Digital Strategy, edition-based publishing, Evening Editions, Innovation, Ouest-France. Bookmark the permalink.